Slow Sleep – the blog of sleep: Sleeping in the plane or the ferry: how to do it? Is everything ready for the holidays? Suitcase prepared? Water bottle closed? Passport? Sunscreen? Flip Flops? What about your smartphone charger? You forgot your swimsuit or mountaineering boots, didn’t you? A long journey on the plane, with different time zones to cross, might be the right time for a lovely nap or… a horrible nightmare!!! To sleep well on the plane, it is important to be free, even mentally; therefore, the best tip is to bring in your hand baggage containing only the most indispensable things: you are going to fly better if you are free from the burden of worry. It can be helpful to have a travel pillow, an accessory which might be important for the correct neck posture. Clothing is important too: if you need to face a long travel, comfort is more important than the glamour. The place to sleep? Well, a place near the airplane window can turn out to be useful, as the “windowsill” can become an excellent support point. If the lights do not allow you to fall asleep, an eye mask is your icing on the cake: it will take you directly to the dreamland. If you are not among those who can make their sea crossings in a cabin, with all the related comfort, you might need to turn to the most trusted method and spend a night in the ferry: the so called “deck passage”. To sleep well in these conditions, it is important to have a good support once lying down, and for this reason a little mattress is almost indispensable, especially if it is comfortable. The same thing can be said about the pillow, especially if it is foldable. Choosing the right place is crucial, especially in the ferry, so in efforts to sleep well and fall asleep faster; do not get on board last, otherwise the less busy areas will be already occupied. To fall asleep faster, an interesting book and a portable lamp might be useful, as well as a bottle of water. 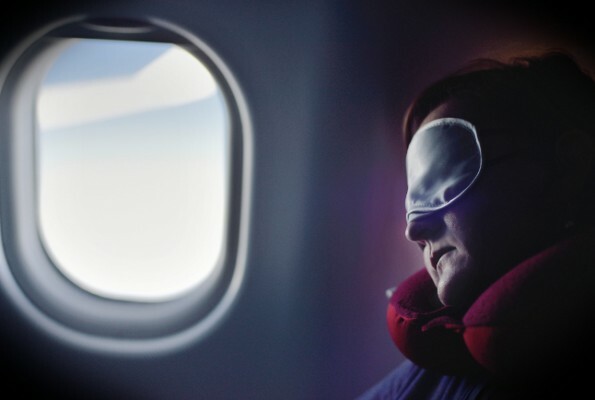 Another important accessory, same as on the airplane, is to use mask to cover your eyes. Be aware of the cold as well: blankets, sleeping bag and hat cannot be missing in your… camp! And once you get to your destination? Well, you might be fortunate enough to find a place which makes relaxation an added value! Sleep is an awesome painkiller!